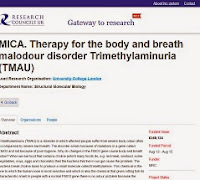 MEBO has been receiving requests from sufferers for updates on the first phase of the UK TMAU research since the Medical Research Councils UK Gateway to Research website states that the £358,124 research grant for ‘Therapy for the body and breath malodour disorder Trimethylaminuria (TMAU)’ was awarded for the period of August 13, 2013 through August 15, 2014, Please be advised that our researchers have been working diligently not only to complete this phase of the research, but also to obtain funding to the next phase of this research. They will update us when the time is right. researchers customarily do not discuss their research...until they have finalized each research phase, at which point they present it in a professional manner in a publication. An important thing to realize about scientists is that they customarily do not discuss their research, and they really don't like doing so, until they have finalized each research phase, at which point they present it in a professional manner in a publication. It is at this time that they are better equipped to discuss their findings in a substantiated, professional and accurate manner. There is nothing researchers want more than to publish their findings, which empowers them to be able to obtain additional grants to go on to the next phase of the research project. They don't need for us to push them along; it really won't expedite matters any, on the contrary, our questions only take them away from doing their research work. The scientific method is a very tedious, long and meticulous process, and scientists cannot jump to conclusions or make declarations about their research until the method has been carried out in great detail to its conclusion. The scientific method is a very tedious, long and meticulous process, and scientists cannot jump to conclusions or make declarations about their research until the method has been carried out in great detail to its conclusion. Therefore, our contacting the researchers asking for updates only serves to distract from their work those who are inspired to work to help us... This is very counterproductive. I know that sufferers are desperate, but persistently contacting researchers that are working to help us asking them to hurry up the process only works against us. We need to be patient, and we need to be grateful that they are researching to help us. Every time they are interrupted from their work by repeated requests for updates, when they've already explained that they cannot give information until their research phase is concluded, they are consequently forced to stop their research work to reiterate their answer yet again to each sufferer who asks. Each of these events only represents that we are annoying those persons who are inspired to help us! This must stop, and sufferers need to stop writing to our current researchers and creating this unfortunate situation. They have already told us that they would be happy to let us know when they publish their findings as soon as their research phase is concluded in a very methodical and well documented manner. It wasn't too long ago that there was absolutely no formal research taking place on TMAU or any other odor condition that we are aware of. It was only a few years ago that TMAU testing had been discontinued in the US for one whole year. It took MEBO volunteers a great deal of hard work to unite sufferers and experts to promote testing and research again. It will be disadvantageous for us to now interfere with research by continuously approaching our scientists with questions and pressuring them for answers. Please, help in this regard. MEBO will inform our international community as soon as our researchers give us updates. I appreciate this update. Although it isn't update on the trinzyme project, it is promising that mebo is still in contact with the researchers and the research is still in fact going forward. I haven't contacted the researchers (although I have entertained the idea) but I usually check here on this blog for updates. I would assume you would be the dirt to know of any publications, progress in funding or need for test volunteers. Thank you for your dedication to our cause. Yes, MEBO is indeed working very closely with experts who are researching for us. For example, if you look at the Gateway to Research, 'Outcomes' tab, you will see that MEBO was identified by our experts and by the Medical Research Council as the "Patient group MEBO" that would be impacted by this research. http://gtr.rcuk.ac.uk/project/772B5BB8-C185-455B-9AE2-C4BC7F8369DF Dr. Elizabeth Shephard is a Scientific Consultant to MEBO Research and she is also a member of the MEBO Institutional Review Board. I am most thankful that MEBO and Dr. Shephard have been working together for years. I didn't realize that the funds awarded were only for one year of the two year research. Were they hoping that more funds would be raised in this last year in order to continue? It is not uncommon for research grants to be awarded in phases. It is the responsibility of the researchers to then apply for additional grants for the following phase(s). They have the burden of proof to explain the success of the study in order to qualify. Our researchers are well aware of this normal process, and have already taken action months ago to continue to pursue research funding.